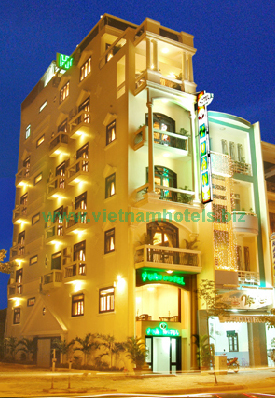 - Y VAN Hotel located central Da Nang City, the River Han is romantic and beautiful. How Da Nang International Airport and Railway Station 3 Km 4 Km. With fresh air and cool very convenient for your guests to visit tourist sites and work in the city. -Y VAN Hotel welcome guests 24/24h with 14 rooms fully equipped luxury, new equipment and advanced standard international airport car park safe and convenient. You can view panoramic Danang romantic night. - Coming to Y Van hotel You will be welcomed and served with caring attentive staff nice and polite young will surely satisfy customers. + Booking Tau Vehicles, aircraft. + Room 2 double beds. + Sofa to the client. + Space cool, comfortable fit for all subjects to rest and leisure time working away from home. - Space harmonious, airy, from here you can see panoramic Da Nang. With full facilities work. + 1 double bed room. + TV - cable television. + Bathroom very luxurious and fully equipped.